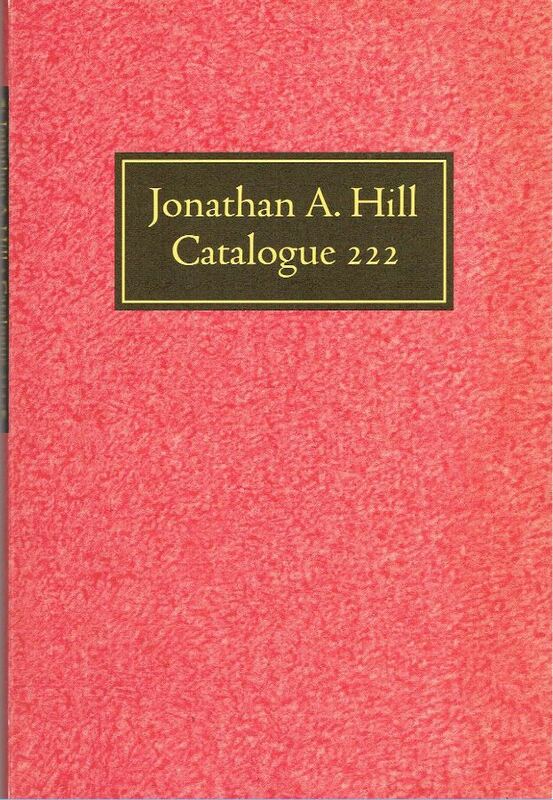 Jonathan A. Hill Bookseller has issued Catalogue 222. This catalogue is divided into seven sections, and the headings of each provide a good summary of what sort of material can be found: (1) Art, Architecture, & Archaeology, (2) Early Lithography, (3) Miscellaneous, (4) History, (5) Military History & Tactics, (6) Language & Literature, (7) Gastronomy. Don't look for much in the way of recent books here. These will appeal to the antiquary, with dates beginning with the numerals 16, 17, and 18. These are some examples of what you will find in Hill's catalogue #222. We begin with an item that will appeal to people who like prints. It is not a print itself, but a catalogue of a collector who liked prints the way Thomas Phillipps liked manuscripts. Item 25 is Catalogue de Livres d'Estampes et des Figures en Taille douce. It is a catalogue of the print collection of Michel de Marolles, published in 1666. De Marolles was the abbot at Villeloin, and he had a passion, perhaps obsession for prints. Hill tells us he began collecting prints in 1626 and by 1644, they consumed his life. Prints were not highly collected at the time, nor were there many who collected anything on the scale de Marolles collected prints. He was described "as among the first of private collectors in history to sacrifice his life and fortune to his passion," and earned the reputation as the "Father of Print Collecting." His was the largest print collection ever at the time, consisting of an incredible 123,400 prints when he sold it. They were kept in 400 large volumes and 141 smaller ones. Today, they make up the foundation of the French National Library's Department of Prints. De Marolles had purchased several others' collections en bloc and sold his the same way to Colbert in the name of the King in 1667. Priced at $12,500. Oh, that was only de Marolles' first print collection. After he sold it, de Marolles began building a second collection. Here is the catalogue of that second collection, also titled Catalogue de Livres d'Estampes et des Figures en Taille-douce, this one published in 1672. In just six years, he managed to build a collection of an only slightly more modest 100,848 prints and 10,576 drawings. Hill notes that the second catalogue is scarcer than the first. This collection was dispersed more widely after de Marolles' death in 1681. Item 26. $10,000. William Beckford was another passionate collector, in his case books. He was also a monumental spendthrift. Beckford, also an author, spent his life dissipating the fortune he inherited. Item 8 is a book devoted to another means of dissipating that fortune employed by Beckford: Graphical and Literary Illustrations of Fonthill Abbey, Wiltshire; with Heraldic and Genealogical Notices of the Beckford Family, by John Britton. It includes 11 engraved plates of the Gothic castle Beckford constructed over a period of many years. This book was published in 1823, the year in which Beckford was forced to sell the castle and his collection of 20,000 books as he had run out of money. Sadly, Fonthill Abbey was poorly constructed, and within 20 years, had so deteriorated that it had to be demolished. Item 8. $950. Next we have Wagon Road from Fort Defiance to the Colorado River, by Edward F. Beale, published in 1858. Beale was an amazing person and a 19th century American success story. He had been a naval officer but performed numerous tasks in the West and elsewhere for the army and five American presidents. His assignments involved many transcontinental travels, supervising Indian relations, surveying routes for wagon roads and the transcontinental railroad, disguised overseas investigations, even Ambassador to Austria-Hungary, all the while obtaining the largest private landholding in the country, the Tejon Ranch in California, and becoming very wealthy. Eventually, he retired to a house across the street from the White House. At the time of this book, Beale was tasked with taking camels from San Antonio across Texas to El Paso, north to Albuquerque, and then west to Fort Defiance, still part of New Mexico but today eastern Arizona, and finally to the Colorado River on the California border. The Army believed camels would make good transport animals in the desert, a logical theory, but for whatever reason it never quite worked out to their satisfaction. This book focuses on the stretch of what was known as Beale's Wagon Road from Fort Defiance to the California border, though the entire route went from Arkansas to Los Angeles. His road essentially became the way for Route 66, and now Interstate 40. The book contains a large map of the proposed route for the wagon road and Pacific Railway. Item 37. $500. Item 66 is Miguel de Cervantes' The Life and Exploits of the Ingenious Gentleman Don Quixote de la Mancha. Translated from the Original Spanish... by Charles Jarvis. Jarvis' translation was published in 1742. The book itself needs no introduction, but this copy is notable as having been owned by, and containing the bookplate of, Edward Gibbon. Gibbon was an historian, writer and Member of Parliament, whose is best known for his opus The History of the Decline and Fall of the Roman Empire. Its six volumes cover 1,500 years of the Empire in its various forms. Gibbon evidently held Cervantes' work in high esteem as he owned an edition in Spanish and two editions of a later translation in his library. $22,500.